On Sunday, a shocking outburst of lethal violence took place in Texas; two rival motorcycle gangs opened fire outside a Twin Peaks restaurant franchise in Waco, leaving nine people dead. It's vaulted the two sides of the conflict — the decades-old Bandido and Cossack gangs — into the national consciousness in a big way. As such, you might have some questions. For example: what's up with the Bandidos' jackets? For the uninitiated, both the Bandidos and Cossacks date back to the late 1960s, although the former group is historically far larger and more powerful. Both consider themselves so-called "one percenter" motorcycle clubs, popularly believed to be a reference to a 1940s declaration by the American Motorcycle Association that 99 percent of motorcyclists were law-abiding. So, basically, it's a proud label of the outlaw, and make no mistake, the Bandidos have lived up to that reputation through the years — they've been implicated in a lot of criminal activity throughout their history, including drug production and trafficking, according to the Department of Justice. Their founder, Donald Chambers, even did 11 years in prison for murder. But this grisly history notwithstanding, the jackets sure are a peculiar look. Obviously, the name Bandido has a rather culturally appropriative ring to it, and that's capped off by the image sewn across the backs of their membership — a caricature of a paunchy man in a sombrero, holding a pistol in one hand and a machete in the other. The meaning of the "1%" patch is plain enough — as described above, it's a reference to the group's outlaw status. The MC part stands for "Motorcycle Club." As for the guy pictured, well, it's supposed to be a physical representation of a Bandido, unavoidably coming across as racist. According to the lore of the group, founder Donald Chambers chose this name as a salute to Mexican outlaws, though it undeniably strikes a strange tone if it's plastered across the back of a middle-aged white man. At the very bottom of each Bandido jacket is the name of the location the biker hails from, and that need not be limited to Texas, or even the United States. 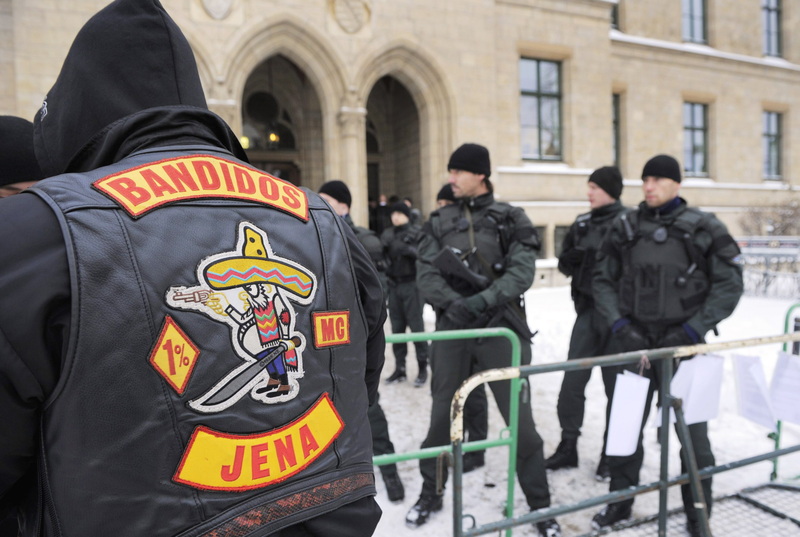 The Bandidos have a bona fide international presence, even as their membership isn't staggering in global terms — the Department of Justice estimates that there are between 2,000 and 2,500 members, but a simple Google Image search turns up jackets hailing from places as far-flung as Australia, France and the Philippines.